What Google Sheets Triggers and Actions are Supported? My Google Sheets Trigger Zap stopped working! The Updated Spreadsheet Row trigger stopped triggering! 400 Error: Blank rows cannot be written; use delete instead. Error: "Invalid query parameter value for grid_id"
New Spreadsheet Row - Notifies your Zap when a new row is added to the bottom of a spreadsheet. New Worksheet - Triggered when you create a new worksheet in a spreadsheet. New Spreadsheet - Triggered when you create a new spreadsheet. New or Updated Spreadsheet Row - Notifies your Zap when a new row is added or modified in a spreadsheet. Create Spreadsheet Row(s) - Create one or more new rows in a specific spreadsheet (with line item support). Create Worksheet - Create a blank worksheet with a title. Optionally, provide headers. Create Spreadsheet Column - Create a new column in a specific spreadsheet. Delete Spreadsheet Row - Deletes the content of a row in a specific spreadsheet. Deleted rows will appear as blank rows in your spreadsheet. Please use with caution. Create Spreadsheet - Create a blank spreadsheet with a title. 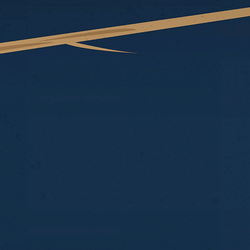 Optionally, provide headers. Create Spreadsheet Row - Create a new row in a specific spreadsheet. Update Spreadsheet Row - Update a row in a specific spreadsheet. Lookup Spreadsheet Row - Finds a row by a column and value. Returns the entire row if one is found. Find Many Spreadsheet Rows (With Line Item Support) - Finds many matched rows (10 max.) by a column and value. Get Many Spreadsheet Rows (Advanced, With Line Item Support) - Returns many rows (20 max.) as a single JSON value and flat rows (line items). Admin/owner permissions: For triggers and search steps, View Only access to the spreadsheet is sufficient. For create/update actions, you must have full Edit permissions. 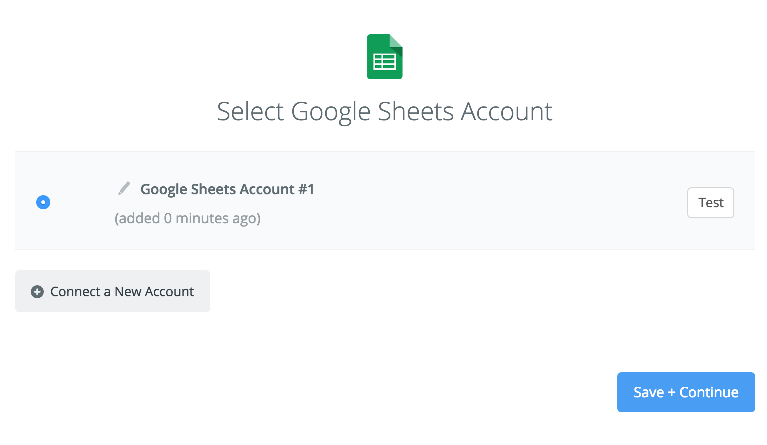 Paid/versioned account: Any version of a Google account can be used with Google Sheets. Note: If you use a Google Sheets trigger, you should always turn your Zap OFF before making changes to your spreadsheet, and only turn it back on when you're finished changing the spreadsheet. Click on that. 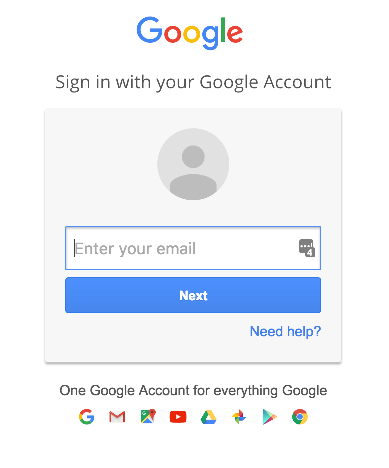 You should then get a pop-up window from Google asking you to log-in to authorize the connection between that Google Sheets account and Zapier. If you are already logged in to your Google account on your browser, you will be asked to approve access to Zapier. 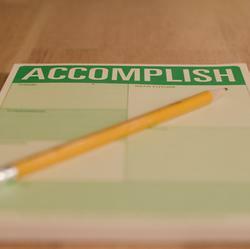 After logging in and approving access, you'll be returned back to your Zap and your Google Sheet account will now be successfully connected. 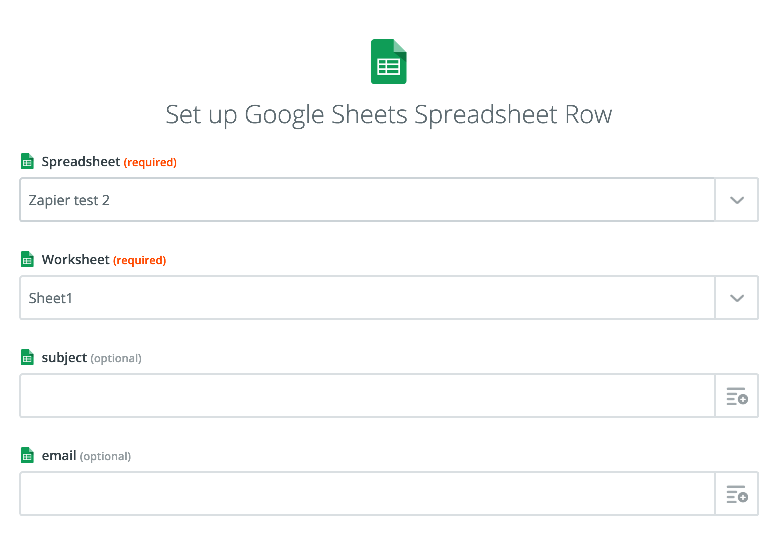 To use Google Sheets with Zapier you need to set up your spreadsheet in a very specific way. If you don't set up your spreadsheet this way, you're likely going to have problems. Pay close attention. The first row must have titles for any column headers you want to be able to see in your Zap. The second row must have content for any columns you want to be able to see in your Zap. There can be no completely blank rows before the end of your spreadsheet. Zaps can only add rows to the end of the spreadsheet and not any other row. We recommend all your columns have text in the header/top row, but you must have text in the first column header, especially if you are using the Create Spreadsheet Row action. Without any text there, the Zap will send your data to the top of the sheet rather than to the bottom. Do not add or delete rows to your spreadsheet, especially in the middle of data your Zap has already recognized. This can cause errors with your Zap. If you are using the Updated Spreadsheet Row trigger, your Zap will trigger even if you update a column that you are not using in the action side of your Zap. Do Not Add New Columns. Editing your spreadsheet while a Zap is already live is a bit like trying to fix a leaky faucet with the water turned on. Needless to say, you're going to get wet. So if you plan on editing your spreadsheet, then Turn Off your Zap first! If you’re looking to update a row in Google Sheets, you will need to first insert a search action to find the row ID. Updating a row will not work without adding this step first unless you plan on updating the exact same row every time the trigger fires. Let's walk through how to do this. The first step here is to create a Zap and select your trigger app. For this example, let’s create a Zap that uses Eventbrite as the trigger that will update a sheet every time there is a new attendee to an event. This way, we can keep an up to date sheet of attendee contact information in a Google Sheet and track who is attending the event. 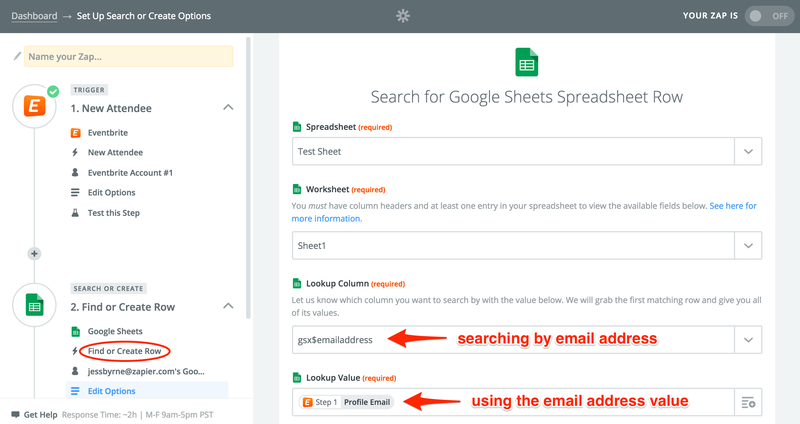 After setting up the trigger step, you’ll want to add a new step for Google Sheets and choose the "Lookup Spreadsheet Row,” action. The “Lookup Value” field tells the Zap which data we are going to use from the trigger step to perform the search. For this example, we'll pick “Email" because we want to conduct a search using the email address of the attendee who registered for your event through Eventbrite. In the “Lookup Column" section, you’ll need to choose which column you want to search by in the drop-down menu. 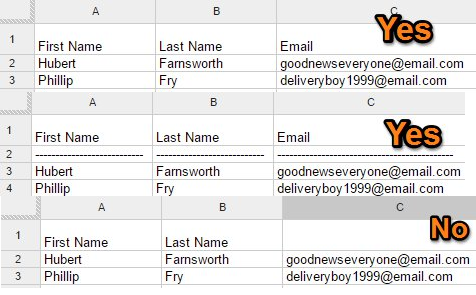 In this case, we'll want to pick the “Email Address” column because we want to check if the email addresses of the Eventbrite Attendees match any of the email addresses in the “Email Address" column of our Google Sheet. The idea here is that we want to use a value to scan through the spreadsheet with to see if any rows have a matching value. If there is a match, the step will be successful and the Zap will move onto the next action step, with the ability to use data from the row that was found. Note: If there are multiple matches, the Zap will return the first row it finds from the bottom up. You'll finish up Step 2 by testing it to find a matching row. 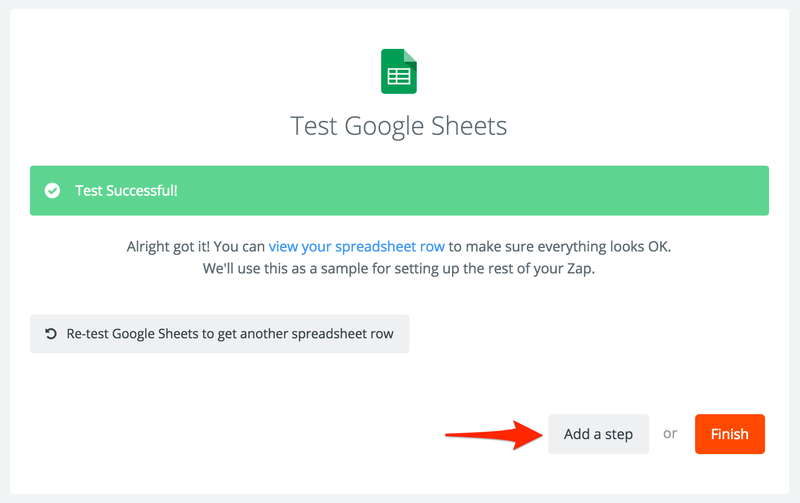 If the row likely won’t exist yet, you can check the "Create Google Sheets Spreadsheet Row if it doesn't exist yet?” box and then tell the Zap how the row should be created. Now that the Zap has found your row, you’ll want to use the row ID that was returned to dynamically update records. You’ll want to click on the “Add a step” button to create another step in your Zap. 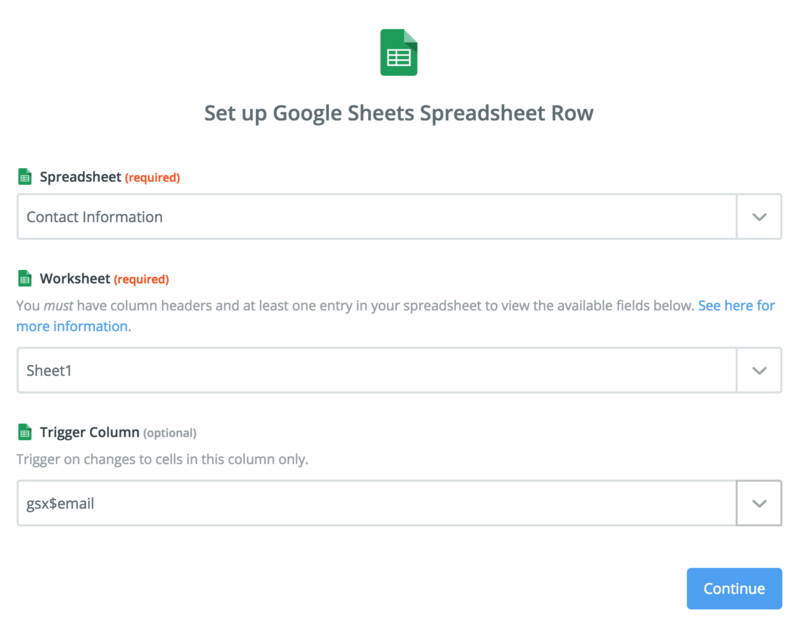 For this next step, you’ll want to again, choose Google Sheets as your app, but this time, choose "Update Spreadsheet Row" as the action. 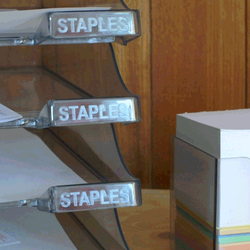 In this step, you’ll want to choose the same Spreadsheet and Worksheet as your previous step. 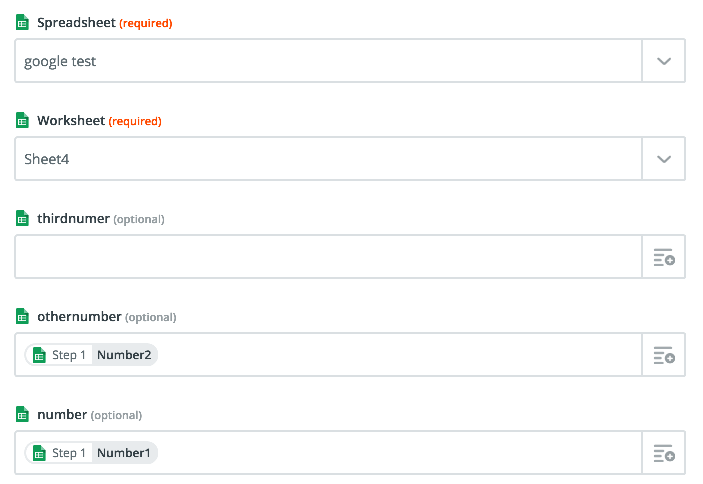 When you get to the “Row ID” field, you will want to choose the row number or ID from the list of options returned from your “Find or Create Row” step. This will allow you to dynamically update rows in your spreadsheet because of the previously added search step. Under that field, you will want to be sure to fill out any and all fields you wanted to update in your spreadsheet, using the data from your trigger step. The last steps here then are to test your Zap, make sure the row was updated in your spreadsheet, and turn on your Zap. If you're using Google Spreadsheets for the Trigger side of a Zap and it suddenly stopped working, verify that you didn't accidentally insert a blank row anywhere. 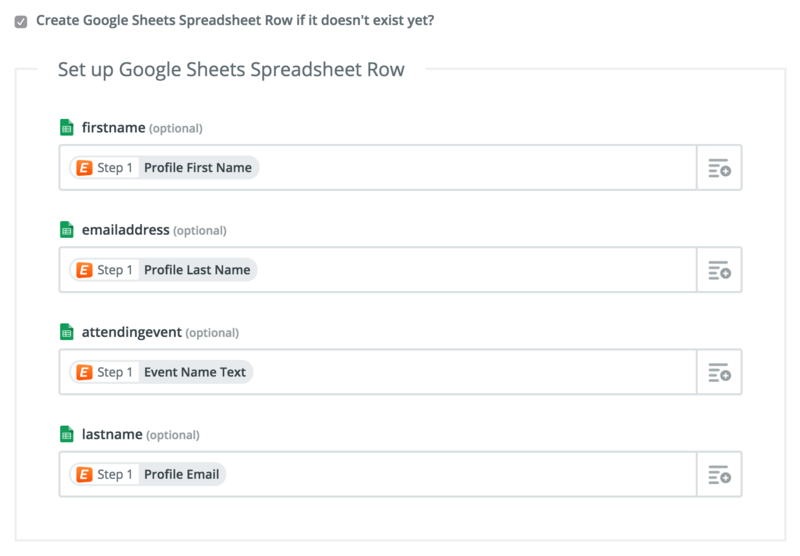 Zapier interprets a blank row as the end of the spreadsheet. Deleting existing rows or columns. Adding rows anywhere other than to the bottom of your sheet. 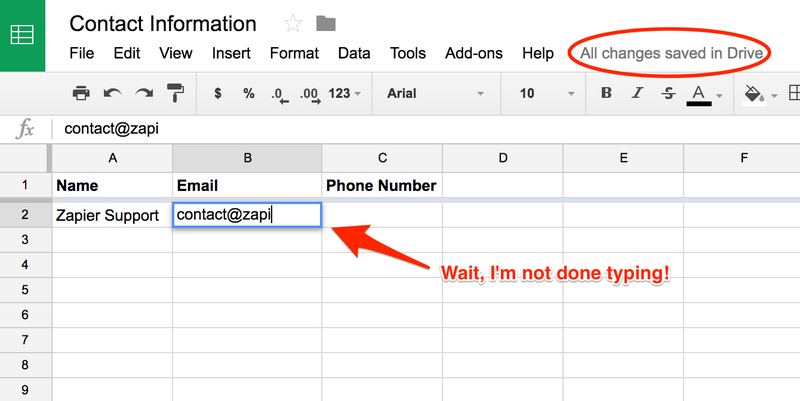 If you need to make any of those types of changes to your Google Sheet, you will need to turn your Zap off while you make the change, and then turn it back on again after. Are you getting an error that says something like cannot parse range or something like 400 Error: Requested writing within range ['DO NOT EDIT: Feed via Zapier'!A74], but tried writing to column [B]? Do you have a colon (:) in your worksheet or spreadsheet title? If so, try removing it - colons in spreadsheet and worksheet titles can sometimes cause a Zap to malfunction. Do you have fields mapped in your Zap? This error sometimes occurs when the Zap attempts to add a completely blank row. We highly recommend not renaming columns in your spreadsheet after you set it up to work with Zapier once. If you do this, the Zap may no longer be able to locate your columns in order to insert data. A common symptom of this ailment is when fields suddenly go missing or become empty in Zapier. To resolve this issue, please turn your Zap off from your Dashboard and remap the field into the Action in your Zap. Then, turn the Zap back on to get back on track. If you’re using the “Updated Row” trigger and choose “Any column” to monitor, any change to a row including adding a new row will trigger your Zap. The best time to use this trigger is when you want to look for changes on a specific column in a spreadsheet. 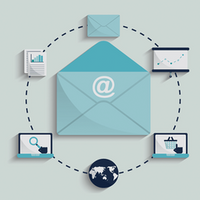 For example, triggering when an email address is added so we can add the contact to a mailing list. 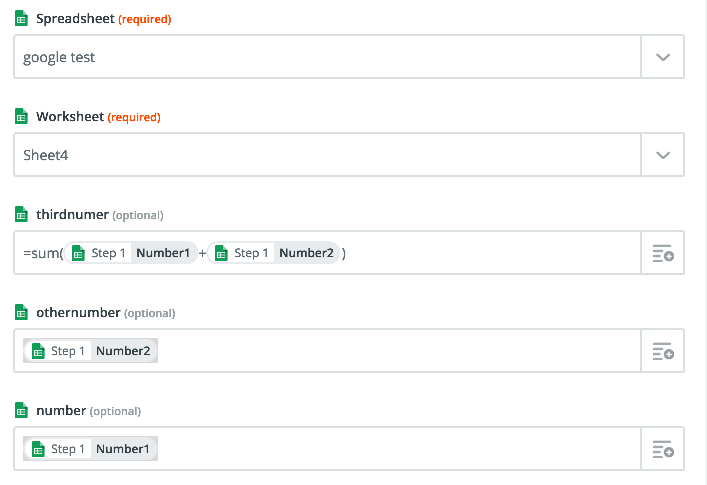 Please note that if you create an empty row in the trigger column, it will still trigger your Zap - this is because that new row is seen by Zapier as an 'update'. You'll want to add a Filter to your Zap if you don't want it to run when the trigger column is empty. If you are using the “New Row” trigger and manually type new data into each new row in your spreadsheet, the Zap may trigger in the middle of entering that data before you get the chance to finish, causing incomplete data to be sent to the following step in your Zap. It is best to use the “New Row” trigger when data is being entered into all columns of a row almost simultaneously. This way, we will be able to capture all data entered. If you need to manually type rows in your spreadsheet OR if you’re needing to collect data over time and then trigger your Zap once all data has been entered, you may be best suited using the “Updated Row” trigger. The best thing to do here is to add a new column to your spreadsheet called something like “Send to Zapier”. 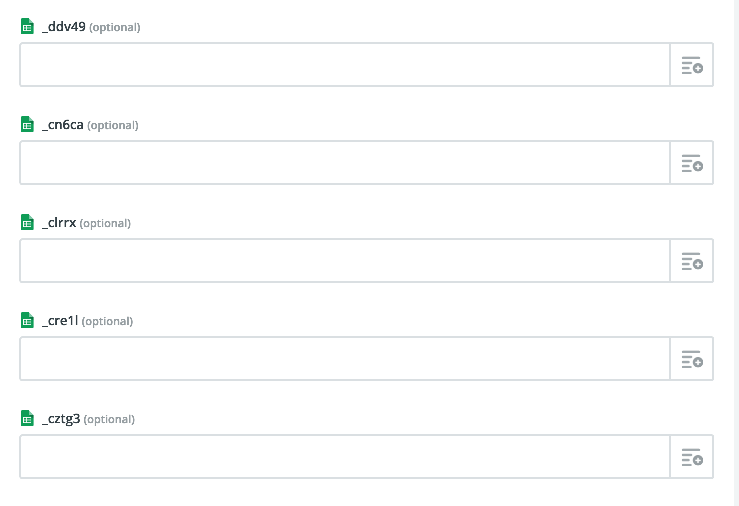 When setting up your Zap, you will then want to choose the “Sent to Zapier” column to monitor. Before testing, go ahead and place an “X” or anything you’d like in that column to trigger the Zap. The test should bring back the data from the row where the “X” was placed. If you're watching for changes to a column, we only see new values in that column. If you update the column of an existing row to a value that Zapier previously saw in that column in that row, we won't see the new value. You will need to either choose a column that will only have unique values, or make a new one which will. For example, if you had X in the Trigger column, then changed it to Y, the Zap would trigger. If you then changed it back to X it would not trigger again, because we've already seen X in that column. Note the final item in the list. To use this, you'll need to add a ts to the front of unix timestamps to ensure that they are recognized by us properly. This prevents big numbers from being improperly interpreted as dates or times. This error can also look like: ExternalHTTPSConnectionPool(host='sheets.googleapis.com', port=443): Read timed out. The bigger the spreadsheet, the more likely these errors are to crop up. 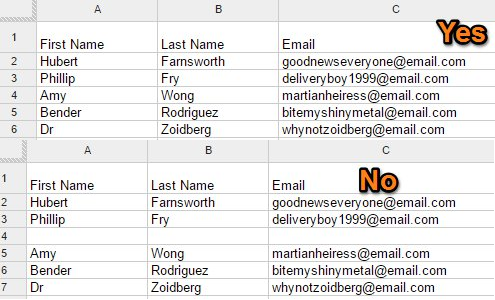 Consider starting a new spreadsheet with less data in it, or moving/deleting any columns your Zap isn't using. If you choose to move/delete rows, make sure the Zap is off while you do this. Once you're done, you can turn it back on. If this error pops up with Google Spreadsheets as the Trigger, there is little concern about data loss since the likelihood that Zapier catches data the next time around is quite high. That said, over time these errors will grow more frequent, potentially causing your Zap to be turned off for a high error ratio, and you should reference item 1. If this error pops up with Google Spreadsheets as the Action, then there will likely be data loss on the action side. 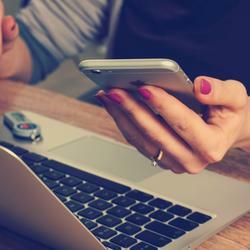 To recover from this, try replaying that specific task from your task history. 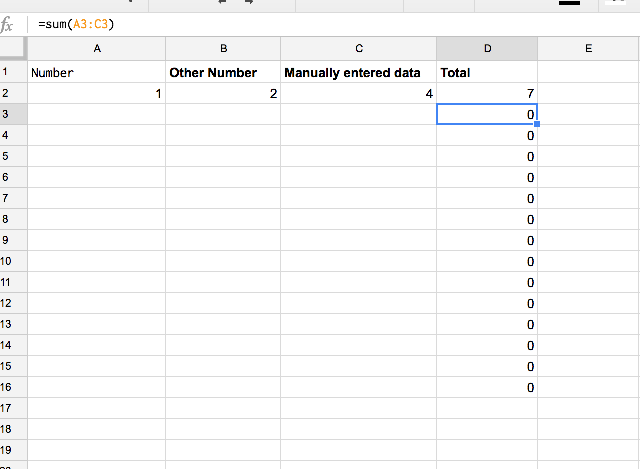 In general, Google Spreadsheets API isn't built for the amount of data you're likely trying to push through. 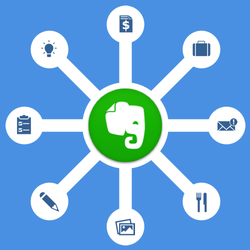 If you're considering an alternate solution, an app like Airtable, or a database, like MySQL, is a popular next step for many people with this amount of data. 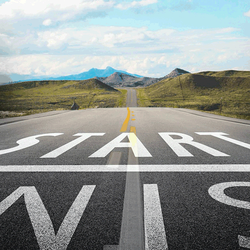 If you aren't sure what to do, just send us a message with what you are trying to do and we can help come up with a solution. If you see this error, it means that your Google Sheets connection somehow failed. To fix this, go to your connected accounts page in Zapier and click reconnect on the failing Google Sheets connection. Your Google Spreadsheet can be configured so numbers, dates, times, and different currencies can be recognized differently when entered into a column. If your data isn't coming across how you hoped it would, you might want to try changing the format, which you can learn more about here. To avoid this, format your column to another date format. No trigger fields matched to the columns on the spreadsheet. Add trigger fields or other data into the Action Fields. Testing the Zap, but using a sample trigger that was blank. Some apps provide a default sample for field matching, but the data is blank. Add a new item (for example, fill out a new form entry with all the fields filled in) and use that for testing, instead of the blank default entry. If you see this error in a zap, try re-selecting your 'Worksheet' and 'Spreadsheet' in your zap. If that does not help, be sure to let us know. If you see this error in a zap, check to see if your spreadsheet is locked or has "protection" on. This prevents Zapier from being able to write to the sheet, so you'll need to unlock it. Unfortunately, the Update Spreadsheet Row action won't clear out fields. 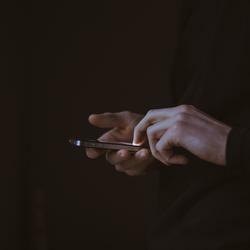 If you have text in a cell and you want to replace it, you'll need to send something along, like a dash or a formula that will result in a blank cell, in order to update it. If a field is blank, we don't send anything. An example of formula that you can send along is: =iferror("",""). This will overwrite whatever is in the cell but result in the cell looking like it's blank. Alternately, you can use the "Delete Spreadsheet Row" action to clear all data out of a row. If your trigger doesn't provide line items, don't use this action, use Create Spreadsheet Row instead. This error usually means there's a problem with the Worksheet. In almost all cases, re-selecting the Worksheet fixes this issue. A different Spreadsheet was chosen without choosing a new Worksheet. The Worksheet was deleted or moved. The Worksheet is set to a custom value. Unlike most other fields, it's unfortunately not possible to set a Worksheet field to a custom value. This is likely because you have a blank first row in your sheet. You'll want to delete the blank row, then reselect the Spreadsheet and Worksheet in your action, and the column names should refresh to match your spreadsheet. You can find more info on how to correctly format your sheet here. You can use any formulas that are available in Google Sheets in your Zap, provided all the variables in the formula are going to be available in the Zap. In that case, you can't reference C2 in the Zap because that data will be manually added later to the sheet. In this case, you should create a new worksheet on the same spreadsheet and use the =IMPORTRANGE formula. This will result in one sheet that is connected to the Zap and another sheet that imports data from the original sheet. This second sheet can have formulas, it can be sorted, filtered, etc and not mess with the Zap. When the Zap runs, it'll populate the Zap Sheet. The Imported Sheet should update based on the values in the Zap Sheet, but your other formulas will work as needed. Un-hiding Column A and making sure it has a header usually resolves this problem. Open a file in Google Docs, Sheets, or Slides. In the top right corner, click Share. Click Get shareable link in the top right of the "Share with others" box. To choose whether a person can view, comment, or edit the file, click the Down arrow next to "Anyone with the link" . Usually, we'll ask for a link with read-only access. Please choose "view"
Finally, press the Copy Link button, and a file link will be copied to your clipboard. 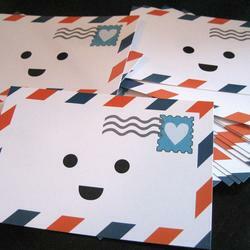 Paste the link in an email or anywhere you want to share it. This can happen when you have a large spreadsheet and Autoreplay is turned on. Consider starting a new spreadsheet with less data in it, or moving/deleting any columns your Zap isn't using. If you choose to move/delete rows, make sure the Zap is off while you do this. Once you're done, you can turn it back on.